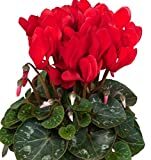 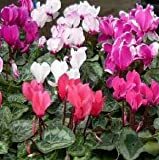 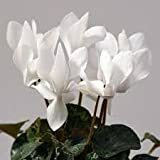 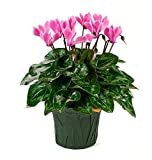 Cyclamen plant growing geophyte of the genus Cyclamen and also known as Cyclamen flower, Cyclamen plant perennial deciduous plant, used as ornamental plant, can grow in mediterranean, subtropical, temperate climate or as houseplant and growing in hardiness zone 3-11. 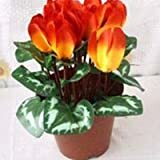 Leavesthe color of the leaf is dark to light green with white the structure of the color is changed between the cultivars, the shape of the leaf is heart to triangle shape. 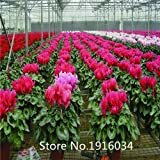 Flower color can be: red, pink, purple, white or more than one color, the flowers have 5 petals, bend up and create like crown structure, the petals can be in varieties of shapes some cultivars flat or twist. 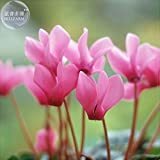 Crown shape flower with 5 petals flower in colors: red, pink, purple, white or more than one color, the, the petals can be in varieties of shapes some cultivars flat or twist.